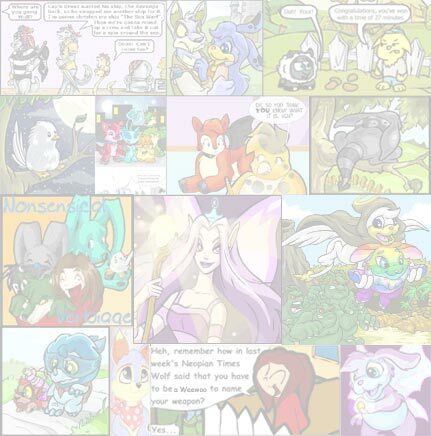 The Neopian Times Week 42 > Articles > Games Galore! GAMES ROOM - Wowee! 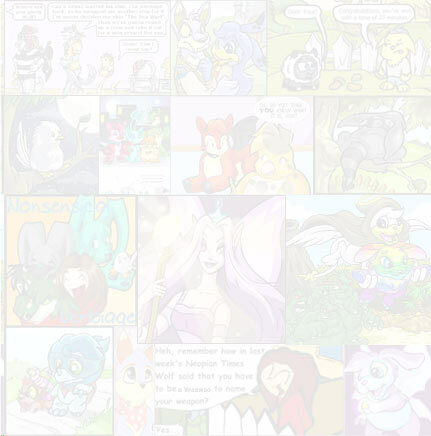 The Neopets Team has been really busy lately! There's so many new games, it's hard to keep up! Basically, this game is a game of survival. You fly around, using the arrow keys to change direction, and try not to hit the walls, your opponent, or the trail left behind anywhere you or your opponent has been. This is not as easy as it sounds... It gets harder later in the game, as the opponents get smarter. In the first level, you often don't have to do anything, as opponents set traps for themselves! The best way to win this game is to set a trap for your opponent. You want to get them into a smaller space than the one you have to manoeuvre, causing them to run out of space first. My personal favourite trap starts right at the beginning, and almost always works. When the game starts, you will be headed straight for your opponent. Wait a second, then turn North, then East again. Now turn North then West, head for the wall, and at the last moment, turn South. This creates a trail that blocks off the West end of the field. Then turn East, and block off the Eastern edge the same way, turning towards the area with the larger space (preferably without your opponent). That way you cut the field in half, and are able to concentrate on your own flying without worrying about traps. Also, Miamouse has slower animation for some reason. The game lags when you or your opponent are Miamouse, so be sure to be extra careful to change directions slightly earlier. The Neopoint Reward may be small for those of us who are computer challenged (my comp is REALLY slow, making those quick changes of direction annoying), we can get around 300 NP per play. On the other hand, this game is extremely fun. This game has a multi-player mode, allowing you to play with a friend. This is even more fun, as you have to outwit another person, instead of the computer players! Just as the Neopets Team tells us, we have to keep the goldfish from falling off the table. Also not as easy as it sounds... Goldfish go at different speeds, and transfer these speeds to one another. Be sure not to hit a fish twice, as it will go flying off faster than the eye can see! Keeping more than one goldfish on the table at one time is difficult! The way to succeed in this game is to have fast reflexes, and also good calculating skills. The slower Goldfish may take more time to reach the edge of the table than the faster ones. Waiting for a slower fish will cause you to lose the fast one. Get the fast ones first. Also, be sure to watch the paths of the Goldfish. If they hit each other, they will bounce off each other in different directions. And be sure not to hit the same fish twice at one side of the table, as that will cause it to speed across the table faster than the speed of light (well, not quite). Plus, and fish a speeding fish hits becomes a speeding fish, and the original one looses momentum. Also, you sometimes randomly get a slow fish. These move at about half speed. If these hit another fish, they also transfer their speed to the other fish and move off at a normal pace. How complicated! Ummm.... Pick up foods, try to get combos... what else can I say? Oh! One thing... you have to wait for Max to throw the food before you can start collecting more. So if you see a good combo, grab it before you have to just let it go by. You get double your score in Neopoints, which for me ends up like 200 a game. For something as simple as this, it's actually pretty good! Once again, sounds quite simple... isn't. You, as Glubgar the Scorchio, have made the mistake of getting into the volcano... Better hope those flying rocks, gas clouds, and lava missiles don't hit you! This game is more skill than strategy, but there are a few things I can advise you on. First of all, the blue circles that fly towards you are VERY helpful. They are basically an extra life. If you can get one, so much the better, as you can crash without dying once. After crashing, the shield disappears, but you remain alive and can get another shield. Hitting a cloud is another matter altogether. As we are told, it slows us down. Unfortunately, it only slows vertical movement, causing you to go down much slower. This prevents you from using the brake and swoop strategy I will discuss at the end of this paragraph. Also to avoid: the block-like rocks, this sides of the tunnel, and the small orange lava missiles. These will kill you instantly, ending your game (unless you have a shield). Now my favourite piece of advice. The brake and swoop strategy. This allows you to avoid rocks without hitting the walls. Most rocks can be avoided by timing, but sometimes there are rocks that you just can't fly over. When you need to fly under a rock that's headed upwards but not at the top yet, fly straight at it. Before hitting it, put on the brakes (hold the spacebar). After a split-second, the rock will have moved on, and you will be falling. Quickly press your mouse button. This allows a ducking action. I bet you could have figured that out yourselves, but I had to put SOMETHING useful in this section. This is � of your score. When you first start out, that means about 30 NP But you can soon work your way up to at least 400 NP. per play with no trouble at all. Neopets claims this game is addictive. Be warned: they're right! That's all for now, hope I haven't missed anything!